His Excellency Governor Bowen accepted the services of 34 Cambridge Cavalry Volunteers on 13 January 1872. Captain Runciman wrote to Major Jackson (the Senior Cavalry Officer at Te Awamutu) requesting that the Cambridge Corps be given the same privileges as Te Awamutu – to be paid for drills and parades. As Militia men they had been paid 4/- for every day they drilled but could not afford to lose both the time and money and enrol in the Cavalry Volunteers. James Runciman advised that as Cambridge was a frontier settlement it would have a salutary effect to have a strong force of mounted volunteers, for the preservation of peace throughout the whole Waikato as the force could be rapidly moved from place to place. All members provided their own horse, saddlery and clothing and were armed with carbines, revolvers and swords. They were called out to drill twice each year for a period of six days each time and occasional field days were held with neighbouring troops. Troops were formed in Cambridge, Hamilton and Te Awamutu and these proved their worth when Te Kooti was in the area and during the scare following the murder of Timothy Sullivan in 1873. On this occasion every member who was within 20 miles assembled at the rendezvous before noon the next day. Their great value was in the confidence given to settlers and their families and as a deterrent to hostile action. 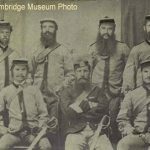 The first officers of the Cambridge troop were Captain James Runciman as Officer in Charge, Lieutenant Richard Parker, Sub-Lieutenant John Fisher, Troop Sergeant Major Robert Kirkwood, Sergeant George Hally and William McI. Clare, Corporals Jas P Campbell, Robert Fisher and Jared Allwill. Trumpeter was Reuben Parr and Farrier Thos Gemmill. The Government then agreed to pay each volunteer 15/- per every day he attended drill. In 1881 this was reduced to 7/- and the last pay roll is dated May 1882. The longest serving members were Jared Allwill, John and Robert Fisher, James Forrest, William Howie, Robert Kirkwood and James Runciman.